TOP Fuel drag racer Damien Harris has a burning desire to complete some unfinished business in this weekend's Fuchs Winternationals at Willowbank Raceway. Harris arrived in Ipswich for last year's event needing to win to take the series. But he was denied that opportunity when rain put an end to the racing. This time around, Harris is locked in a neck-and-neck battle with arch rival and last year's series winner Darren Morgan. 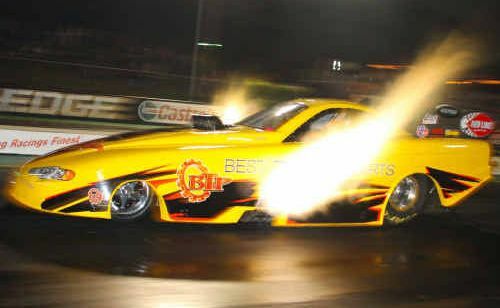 After taking out the Nitro Champs at the Sydney Dragway last month, Harris leads Morgan by just 2.5 points. Harris said it would be fantastic if results went his way and the series was wrapped up before a potential sudden death showdown with Morgan in the final. "It would be nice to have the championship over and done with early to focus on the actual racing ... it's going to be a nervous weekend for everyone," Harris said. "I'm hoping it is playing more on Darren's mind than ours. "I haven't won a series yet but he knows what it is like to have one so I'd like to think it affects him more than me. "We've definitely got nothing to lose." The biggest challenge for Harris might not come from on the track. He is battling the flu which places enormous strain on drivers - as much as six g-forces during the pass, followed by negative six g-forces when the parachutes are released. "I'm an asthmatic so sucking in air is quite hard to do at the moment. Hopefully the medication will kick in and I'll feel good by the first qualifying session," he said. "When I went 514kph in Sydney recently it knocked the wind out of me. "My lungs were pretty good that day too, but it felt like my head nearly came off my shoulders." Doorslammer, Top Bike, Pro Stock and Pro Stock Motorcycle racers, as well as competitors from the Rocket Allstars Racing Series.